The internet has changed a lot of things in modern life. We now consume more music, videos and news online than ever before, and as a result those industries have had to change dramatically in order to compensate and survive. Music and video retailers are closing down while paid-for print media is feeling the pinch due to the fact that people can read much of the same quality content online for nothing. Despite this inexorable change, there are some out there who pine for the good old days of physical media. We've already covered the excellent HyperPlay RPG fanzine in the past, and projects like Nintendo Force have gone some way to reviving the glory days of specialist magazines. Now we have a new kid on the block which is focused entirely on Nintendo's latest home system, the Switch. Funded by Patreon donations, the magazine's first issue is now being sent out to those who have pledged support, and we were lucky enough to receive a copy. 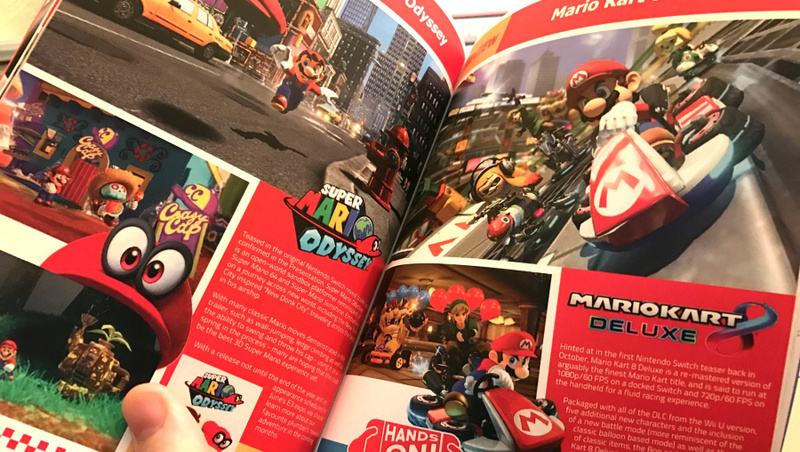 At 48 pages it's rather slim, but this is understandable as the Switch isn't actually out yet - and besides, the team has stated that future issues will be larger as there will be more to write about. Unlike your typical magazine, Switch Player is smaller in size - it's A5 format rather than A4. This makes it more portable (like the console it covers, you could say) and easier to cram in your bag before leaving for work. Despite the low page count, there's plenty of written content inside, including contributions from Laura Kate Dale, Chris Scullion, Tom Phillips and Tim Gettys, as well as an interview with Shovel Knight developer Yacht Club Games. However, the majority of the mag is devoted to covering the many games which are due for release on the system, with titles like Zelda: Breath of the Wild, Splatoon 2 and Mario Kart 8 Deluxe getting a fair amount of coverage. Given that Switch Player isn't a project backed by a major publisher, it shouldn't come as a massive shock to learn that there are some production teething troubles, at least with this first issue. On some pages the text is awfully close to the edge, and in some cases has actually been chopped off when the magazine has been cut and bound. The print quality is also a little disappointing in places, although this could be down to the assets used. Those of you who recall the days of games media in the '80s and '90s will forgive such niggles as it was often the case that magazines from that era (especially in the UK) would be riddled with numerous errors, but even so, it's not like these issues really ruin your enjoyment of the magazine. On the whole, it's well-written and thoughtfully designed, with a good balance of imagery and text on each page. 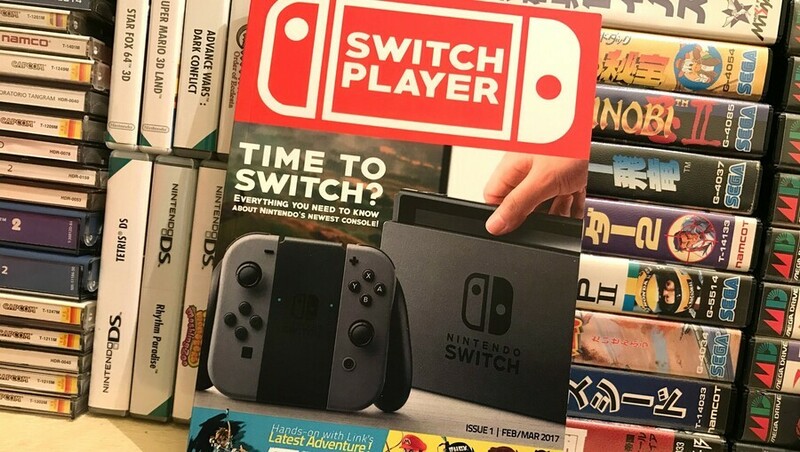 Switch Player isn't totally about print media - it's possible to purchase a PDF version of the magazine as well - but it's clear that the physical copy is the main focus here. The project deserves to succeed as it's providing something that is currently missing from the shelves of your local newsagent: a dedicated Switch magazine. No major publisher has stepped up to produce such a mag, so Switch Player could end up filling this void rather neatly. Issue two is expected in April and should be packed with content as the team get to grips with the console and its games, but in the meantime it's well worth supporting this project by investing in issue one. Who knows, it could be a collector's item some day. Good for them. I loved reading game magazines back in the day but nowadays they're behind on current information and I find everything online as it happens. I want that magazine ! I love paper and ink. 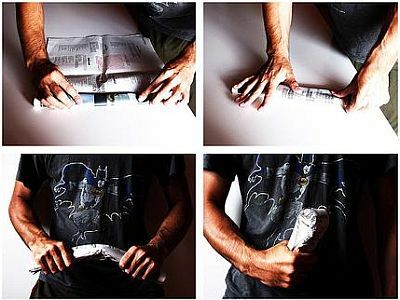 Just sold all my Edge mags. Still have a complete set of Cube (complete with demo discs and VHS tapes) and N64 Gamer mags that I'm keeping. I had over 100 Edge mags, these are just some. @Anti-Matter If you like it, the same team also works on a similar project for the vita : the Vita Lounge. I would disagree about online news websites offering the same quality as printed magazines used to, especially when you look at sites such as IGN and Gamespot. I will definitely support this as it sounds like a great idea, and I do feel nostalgia in having printed magazines. Not interested with ps vita. Just only Nintendo games that I'm interested. I used to love the days when there would actually be enough content to fill up Nintendo-focused magazine's with. You know, back when there was actually games to write about and news to report on. Nintendo is so clamshell these days. I was genuinly sad when the last issues of ONM was published. 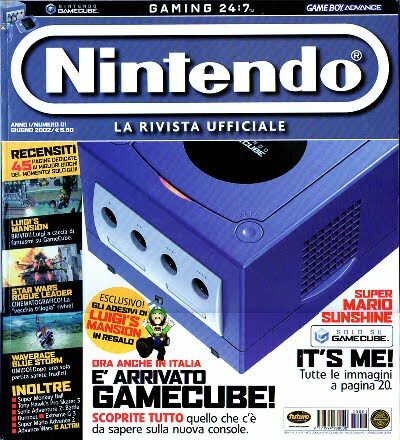 So many memories of N64 magazine, CUBE, NOM...it's Nintendo's fault all these publications when down because Nintendo just doesn't do enough these days to make a solo mag justifiable. It really shows just how much market share Nintendo has lost since the GC days. I don't want this myself but I'm very glad it exists. Got a copy of Issue 1 already and can safely say Switch Player is excellent. Only a couple of letters on one page are chopped off (hardly a big deal), otherwise it's all brilliant! Will defo be getting all future issues. @kincl4 Hi do you kown how much it cost in £? 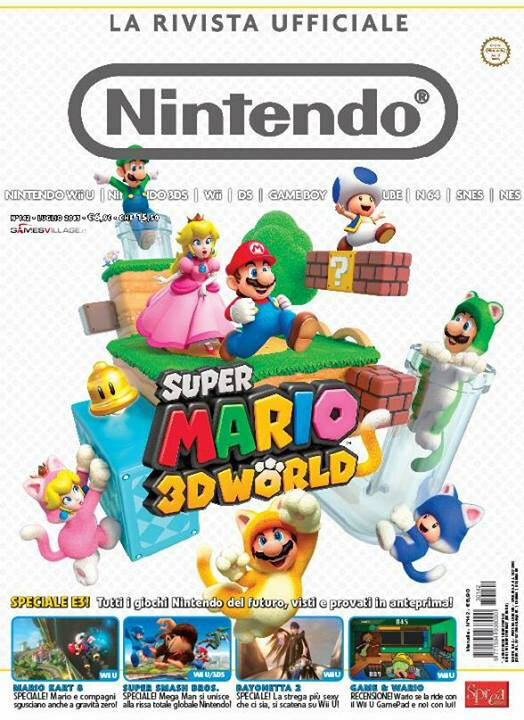 Would be nice to get a new Nintendo focused magazine. i still consider it one of the criteria for a true writer if he or she has had their words published by someone who saw them fit to print on dead trees. nlife "writers" sadly still need to wear quotation marks. @FragRed Mags like Game Informer are a waste if your a Nin fan because they always favor to Sony & MS as they always post Nin content in the last pages of the book & its like 1-4. There are lots of games out there but they never like to give room on the pages for them. That is why I stopped paying for them & won't be powerup memeber any more from GS. Because I buy all my stuff now from Amazon. I need to find a Mag that is Nin only & start buying into that instead. Definitely interested in this; I absolutely loved ONM back in the day so this brings back a lot of memories. @CGSasuke to be fair there isn't actually much Nintendo news and hasn't been since the Wii. I have always bought at least one and back in the day sometimes three Nintendo magazines a month. But during the last couple of years of the last Magazine there were to many embargoes, either delaying a review or not getting a printed review until a month later although a cut down version would be on the Official Magazine site. With bigger Smartphone and tablet screens and instant updates and review news via Twitter, I can't see a need for a magazine now. Last time I was curious about buying a games magazine, I saw it cost eight quid and decided never to bother again. It was a part of my childhood I loved, but in reality the internet is faster, cheaper, more impartial, has less adverts, better pictures and videos and is better for the enviroment. Gaming magazines stopped being fun somewhere about the mid-2000s when all the big ones inexplicably became bland fanboy rags devoid of any criticism. They were duly rewarded with resultant obsolescence. Was thinking of getting this, until i saw three little words ....Laura......Kate......Dale. Then thought no point, it will all be hearsay and completely pointless. Still get Edge and Retro Gamer each month digitally. A magazine can still be relevant these days as long as there is not too much focus on news and reviews. There is a brilliant football publication called The Blizzard that is nothing but editorial content, which means you can pick up a four year old copy and still enjoy it as much now as the day it came out. I'd love to see a games magazine attempt this. I suppose retro magazines are close. I've still got magazines from as far back as the ZX Spectrum era up my parents attic.Your Sinclair is my oldest I think and I've got a few Crash magazines there too. The closing down of the Dutch [N]Gamer magazine and website is actually the reason I'm reading Nintendo Life now. Still sad to see that go. I believe a printed magazine can work if it accompanies a website with more up to date news and coverage. The site can then offer news as soon as it's available, and the magazine can go in-depth about things. Also, magazines definitely need personality from it's writers. Readers should be able to relate to the writers and become fans. There are tons of gaming magazines that took a dull 'third persons' writing approach and they often failed after their first issue. I was a subscriber to Official Nintendo Magazine, loved it, then I passed each issue on to my nephew. If yer man Scullion is involved it can only be a good thing! Why can't I just buy mag in shop or on Amazon.I'm sick of these's patron transitions.I would love to support your mag.But I spent 3 bloody hour's trying to get my paypal working and visa implemented and ect ect. @AlexSora89 Sorry for "switching" language... Anche io dovrei averli tutti (almeno fino a un certo punto), da qualche parte! Non so perché, ma ricordo molto bene la rubrica della "posta del quore", a cui ho anche scritto un paio di lettere molto imbarazzanti, se le andassi a rileggere oggi! Grazie per aver risvegliato questi ricordi! . No thank you. While I enjoyed Nintendo Power when I was younger, I'm able to let go of the past. I enjoyed Nintendo Power because that's all we had. Today, the internet is faster at delivering the content and it's possible to find a more diverse pool of opinions, articles, previews, reviews, and questioners. Magazines today have really lost thier touch, overpriced and content which can be found anywhere. What I want is reviews from not just one persons point of view group reviews roundups that breakdown the features and score acordingly. When this happens again online or in print I'll start to read reviews again. @OorWullie Nintendo Life on line is sort of a magazine, a print edition of this very site would not be possible- sadly. I used too buy those type of magazine every month. I know you can get the info online but there was nothing like a players guide to maps with new games that come out. so you can get all the items. you can do it with older games online, but The internet does not have that for the current ones. I would buy the game and the guide. if the magazine had a section like that and a cheat forum well that would be a purchase. I miss Nintendo Power and Playstation Magazine...even still have all of them (every issue of Nintendo Power I own), even having a few copies of Electronic Gaming Monthly and a few others...it's a shame, I'd rather have the actual magazine and hate reading online or on a stupid I pad. Saw that Playstation Magazine is still around, just called Playstation UK, so I'm hoping that since that came back, I'm waiting for something really nice from Nintendo...say something almost identical to Nintendo Power. I read the digital version of this and it's pretty great for what it is, so I'll give it a hearty thumbs up. PS. I really do miss printed magazines like this (and most of the ones available now are a bit crap). People who've grown up in the iPad generation won't really get it but there's a genuine and tangible benefit to reading printed media. It somehow seems to create a stronger link in your brain or something, particularly the way old gaming magazines like Mean Machines, Super Play, and Computer & Video Games were laid out and formatted, than just scrolling through endless generically formatted websites. Yeah, I wish at the very least I could afford to buy, and it existed, some kind of A4+ sized tablet that let me read digital magazines in basically exactly the same format as they would appear in print—that would be truly awesome imo. Figurati I also have sent in two drawings, and I've flaunted them on NLife as well. I might repost them later in the afternoon if I remember to do so. @blinder2 We paid $6USD on Patreon but I see that's not your bag. Suggest you Tweet them at @_SwitchPlayer - I'm sure they can help you out. @KiWiiU_Freek is there a market I'm pretty sure I have issues 2-50 in the loft. I've definitely got most of their early issues from the mid 1990s. I once had Star Letter in both ONM and NGamer in the same month, what an achievement..
Long for the days of print mags again. I'll be sorting subscriptions for Nintendo Force and Switch Player when I get home. Got complete collections of ONM, NGamer and nRevolution - hunting down the remaining ONMs (I have 1, 2, 3, 4, two odd ones and then 89-the final one, with the exception of 128). Any help tracking them down would be much appreciated! Also, my background is in writing, and I edited a magazine for a year last year, so if anyone from the above magazines is reading, feel free to get in touch if you need contributions! Love it! I've sort of moved on to other hobby and industry magazines (airplanes, mostly) so for shelf space sake I won't be buying this, but there will always be something about cracking open one of those old magazines filled with tips and photos of games you'll never play! @kamikazilucas ...well, you can't defend yourself with the internet for starters.. I used to be a huge magazine hoarder growing up, and it's sad that so many of them are gone. On the other end of the spectrum, the ones that are still alive are horrible. Badly written, and utterly engorged in idiotic politics **cough**Hyper**cough**. Official PlayStation Magazine Australia has always been notoriously bad, too; whether being caught with their pants down (Driv3r 9/10 fiasco), hyperbolic claims ('PS3 is TWICE as powerful as Xbox 360', 'Killzone 2 is the best console FPS of all time', 'MGS4 needs SEVEN discs to run on 360', 'Sixaxis does motion control better than Wii'), or good old fashioned fanboy garbage (usually against Nintendo). I don't know how that dumpster fire is still going. My favourite mag was undoubtedly N64 World/GCN World/N Gamer/Nintendo Gamer. A genuine joy to read, and was always hilarious with its random humour - I was totally gutted when it ended. @Mogster It's Nintendo's fault that their magazines died? Sure... totally nothing to do with the internet rendering them obsolete. Nope. U guys seen the new revealed clips from Zelda breath of the wild? @impurekind I had hoped that the ever upgrading versions of Kindles and the experiments with color e-ink would eventually be able to duplicate print mags. Sadly they just moved on to the Fire for that. Another LCD screen. Yawn. I used to enjoy 64 Magazine and the odd issue of N64 Mag. There was something enjoyable about opening a new magazine. Retro Gamer now scratches that itch! Who else read the text in the photo? I'm going to start leaving this signature around for a while. I still go back and read my Nintendo Power Mags from the late 80s. It's great to play NES & SNES games while reading the original NPs from that time. I'll check out this mag a bit later to see if it stands up to the old NPs. @Bunkerneath I love the idea, but seeing her on the list of writers isn't very comforting... At least I know I'm not the only one who started having second thoughts. @Kage_88 there are still magazines for the other two systems, plus plenty of other general magazines. You can act snarky as much as you want, but the fact is that for the past five years there hasn't been enough Nintendo games/news to fill a magazine every month. I sold them for about $3 Australian a magazine for them. I had them listed for more (and sold a lot for about $6 a mag) but one guy offered to take the rest so I cut a deal with him, and he paid the postage fees. Retro game collectors (like myself) want anything to do with gaming, including the magazines. I'm selling my Hyper magazines ( Australian game mag) on eBay as well, already sold half, still have about 30 or so !eft. I've sold them all over Australia, it's amazing how many people want them. You just have to be patient, they might not sell for a few weeks then all of a sudden people will buy a few bundles. I had them in bundles of 5 to Cut down postage costs. I bought NOM/ONM from 2002 to 2011, and then stopped because I wasn't getting anything from it that I couldn't get from the internet. In the few years after that, I have really enjoyed looking over old magazines, and I really regret stopping (although not really because I went to university and needed to conserve money). Anything I read on the internet will be completely forgotten not too long afterwards. Four months ago I got back into it with Empire magazine (my hobbies have shifted slightly), and briefly considered buying Edge but I decided one was enough. I hope magazines don't completely die out. I'm surprised this isn't a thing yet. Wouldn't be too much extra fuss to make a digital mag would it? Nintendo Force is probably better.I am currently subscribed to it and get new issues mailed to me every two months.They started in January 2013 when Nintendo Power was closed down.The next issue is #26 The Nintendo Switch launch guide.It is physical and digital.Every physical issue includes a poster. Website: https://www.nintendoforcemagazine.com/ To get issue #26 sign up by Febuary 12th. @kamikazilucas ...me too, lol..just havin fun with ya..
@Rumncoke25 Even if it's just a one off thing or an annual Xmas special.I bet it would do very well,at least well enough to make it worth their while anyway. @SH007ME Ahh the old Chelsea Brick.That's what they're called by the thugs in the UK anyway.Not that I'm a thug haha.I assume the name's come from the notorious Chelsea football hooligans of the past using them in battle.Easy to get a newspaper past the police. @kamikazilucas You'd be surprised how hard these things are.A good whack with one of these could knock you out for sure. @KiWiiU_Freek edge was such a treat for me back when I was in the U.K. You can find it in the states too if you look hard. Why did you sell them?! Ancient Crash! And Zzap! Fan here good luck to these guys, think I'll head on over and lend my support ! @OorWullie ...you're right, you can really beat someone to a pulp (so I hear).. Taking up too much room, plus I also have other magazines like a full set of Cube and N64 gamer magazines. 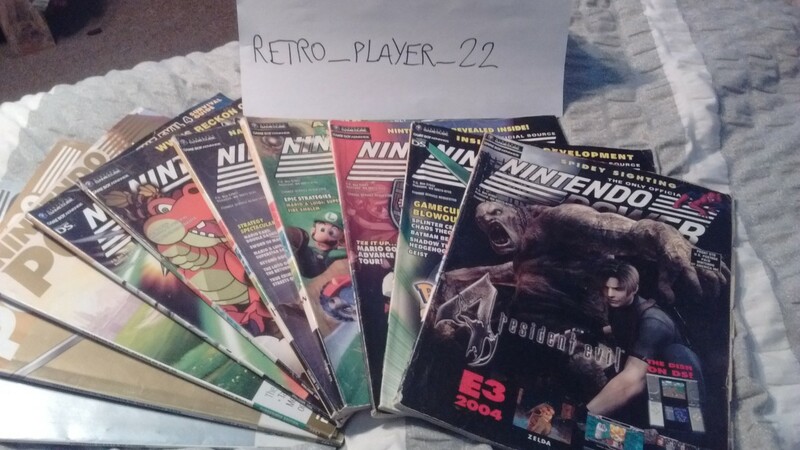 I also have Hyper magazines that I'm selling, already sold Games magazines and a heap of others. Not including over 400 physical games for N64, Cube, Wii, Wii U, Xbox original, Nes, Xbox 360, PS2, DS and 3DS games, so I think my wife has been pretty tolerant. @Mogster with all the games that range from Wii U to 3ds is a lot to cover. But they skip out on the small ones ect.